Xaron is a black sable Czech import, titled ZVV 1. He is a large male with a high hunt/prey drive who loves his protection work. He is extremely quick for his large size and enjoys the ball. From his father's lines, he inherited the old Czech blood which transmit the real civil aggression. From his mother's lines, Xaron, inherited the West German blood which consists of the WUSV world championship competitors. ​Xaron will be used to improve drive, confidence and pigment. Art is a Czech import, titled IPO1 and in training for his IPO2 exam. He is a large male that has a very high drive. This dog lives to bite, has a full grip and hard bite. He is a confident dog that constantly wants to work. He gets his hardness and serious edge from the Egidius lines, his grandfather is the famous Drago Eqidius. He is line bred to Nike Eqidius, Arne Egidius and Aly vom Vordersteinwald. He is a very strong dog overall and one person handler. Art will be used in a breeding where there's a need to improve drive and hardness for protection work. 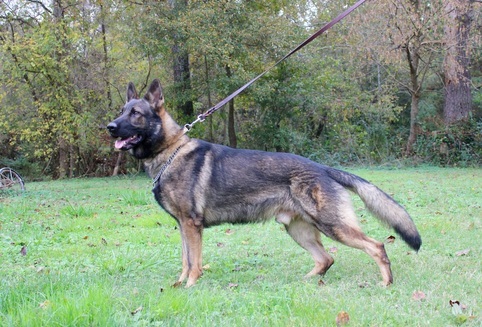 Grimm is a dog which was bred in our kennel and comes from our G litter, parents Togo and Zada. He's an intense large male with a very high prey and defense drive. His natural defense instincts are the true definition of a real Czech Border Patrol/ Police dog. From his father's lines, Grimm, inherited the Gero z Blatenskeho zamku blood from a 3-3 breeding. From his mother side he inherited the Mambo z Pohranicni straze ​blood also from a 3-3 breeding. From both parents Grimm's pedigree consist of almost all of the greatest Czech dogs bred in the z Pohranicni straze police kennel.